George Frideric Handel (23 February 1685 – 14 April 1759) was a German-British Baroque composer. He is famous for his operas, oratorios, and concertos. Handel was born in Germany in the same year as Johann Sebastian Bach and Domenico Scarlatti. He received critical musical training in Italy before settling in London and becoming a naturalised British subject. His works include Messiah, Water Music, and Music for the Royal Fireworks. He was strongly influenced by the techniques of the great composers of the Italian Baroque and the middle-German polyphonic Choral tradition. Handel's music was well-known to many composers, including Haydn, Mozart, and Beethoven. Handel's compositions include 42 operas, 29 oratorios, more than 120 cantatas, trios and duets, numerous arias, chamber music, a large number of ecumenical pieces, odes and serenatas, and 16 organ concerti. His most famous work, the oratorio Messiah with its "Hallelujah" chorus, is among the most popular works in choral music and has become a centrepiece of the Christmas season. Amongst the works with opus numbers published and popularised in his lifetime are the Organ Concertos Op.4 and Op.7, together with the Opus 3 and Opus 6 concerti grossi; the latter incorporate an earlier organ concerto The Cuckoo and the Nightingale in which birdsong is imitated in the upper registers of the organ. Also notable are his sixteen keyboard suites, especially The Harmonious Blacksmith. Handel introduced various previously uncommon musical instruments in his works: the viola d'amore and violetta marina (Orlando), the lute (Ode for St. Cecilia's Day), three trombones (Saul), clarinets or small high cornets (Tamerlano), theorbo, horn (Water Music), lyrichord, double bassoon, viola da gamba, bell chimes, positive organ, and harp (Giulio Cesare, Alexander's Feast). Handel's works have been catalogued in the Händel-Werke-Verzeichnis and are commonly referred to by a HWV number. For example, Messiah is catalogued as HWV 56. 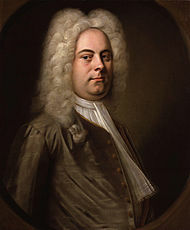 Click here to view all items related to Handel. As you might expect, there are quite a lot!